Guanacaste National Park is popular among researchers – there are three research stations within the park – and visitors with relevant backgrounds can volunteer here for extended periods. Guanacaste National Park is a celebration of a nation’s spirit. The national park, which takes the name of its province, fittingly was established on July 25, 1989 – a day known, in Costa Rica, as Guanacaste Day. The park’s natural riches pay homage to the nation’s diversity, starting with the lowland savannahs in the west and climbing steadily into tropical dry forest, humid cloud forest and, finally, the cool slopes of Orosi and Cacao Volcanoes. Unlike many of Costa Rica’s national parks, Guanacaste National Park is more popular among researchers than tourists. Of course, that shouldn’t stop you from visiting: if you love open plains and rustic hiking, this park is the perfect choice for a day’s sojourn. (For safety purposes, be sure to speak with a park ranger before setting off on a trail.) And if you’re scientifically inclined (with the creds to prove it), Guanacaste National Park offers something extra: travelers with relevant backgrounds are invited to volunteer at the park. 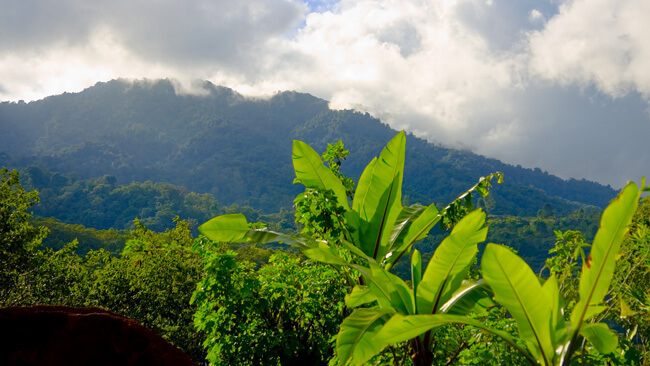 Three research stations – Cacao Biological Station, Maritza Biological Station, and Pitilla Biological Station – host the park’s researchers, who focus primarily on reforestation. The park is comprised mostly old ranch land, and scientists have found that the best way to encourage secondary growth is to do almost nothing at all – when nature takes its course, the park’s lands rebound on their own. For visitors, hiking and wildlife watching are the park’s major draws. The research stations are connected by rustic, wild trails – some of the most undeveloped in Costa Rica. These grassy paths and rocky roads also lead around the Tempisque River and up to the summits of Orosi and Cacao volcanoes, which mark the border of the Continental Divide. If you plan to hike the volcanoes, a professional guide is highly recommended. For multi-day visits, dorm beds are often available at the Maritza and Cacao research stations (advanced reservation required). The park’s wildlife is as diverse as its habitats, and extends to 300 bird species, including owls, ospreys, toucans and Montezuma oropendula. There are also 5,000+ moth and butterfly species, 3,000+ types of epiphytes, and dozens of mammals, among them jaguars, white-tailed deer, pacas, tapirs, and pumas. Guanacaste is the driest climate in Costa Rica, so even during the rainy season (June-November), you’ll often have sunny days. The region is also hot and arid, so if you’re looking for cooler temperatures and greener pastures, the rainy season is an excellent choice. Nearest medical facilities: The closest pharmacies are in Papagayo, and there are several hospitals in Liberia.